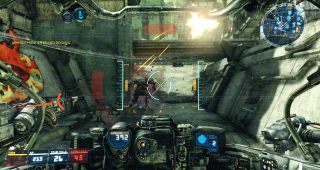 Piloting one of Hawken's mechs is an unusual feeling. They're simultaneously agile and clunky; aerobatic in spurts, but ultimately shackled to the surface by their tonnage. While jetting to a ledge, I usually crunch into the side, but using my thrusters to strafe, I shoot in and out of cover like a water strider. The claustrophobic cockpit makes wide swings as I scan for enemies. Past my HUD, the world looks like a refinery built of scrap metal and then flooded with salt water for 50 years. Hawken's rendering is technically great—maps load very fast and the textures are crisp—but the art and sound direction make it. The unnatural, monochromatic theme of each map sells a blighted sci-fi world so cohesive that the idea of observing "good graphics and sounds" takes a backseat to just being there and experiencing it. During the latest closed beta session of the free-to-play mech shooter , I enjoyed stomping around so much that I was disappointed I constantly had rockets in my face. When it came to actually scoring kills...well, the video above is a bit misleading. I cut together my best moments with three classes—Assault, Sharpshooter, and Rocketeer—but in between those moments were a lot of me exploding. It seems odd to compare Hawken to the very different Tribes: Ascend, but the contrast is useful. Tribes uses large, sparse environments and minimalist bases to emphasize player movement. I think of Tribes' maps less as locations with hills and trees, and more as abstract race tracks. That speed and the slow-moving projectiles make evasion and escape Tribes' primary survival techniques. Hawken, however, is a cluttered place. While its mechs can jet around too, the "fight or flight" choice almost always ends in a fight. If I'm spotted at close range and the other guy fires first, I might be able to jet around a corner, but I won't get far before he's on me again. Either that, or I'll clip a building, stumble off a ledge, get disoriented, and whir around like a broken clockwork toy. So I turn and fight. Unfortunately, he who shoots first generally stomps away victorious. Unless I pull off some impressive evasion or get a couple lucky hits with a high-damage explosive, squaring off one-on-one against a mech with full-health while I'm damaged is a death sentence. So in team matches, sticking together is imperative. Alone, you'd better see the other guy first. As an incorrigible sniper, the Sharpshooter class appealed to me, but only on the Sahara map, which is open enough to make long-range combat feasible. I saw others make good use of its high-impact slugs and scoped sniper rifle on the more confined, irregular maps, but I struggled for clear shots. I likewise fared best with the Rocketeer on Sahara. Its sticky grenades, which fire in threes with a satisfying plunk plunk plunk , are a tough shot when the enemy has lots of cover to dart around, and its swarm of missiles is most effective when you can maintain line-of-sight long enough for a lock-on. I was most successful with the basic Assault class mech. The other two are difficult—and probably more rewarding had I the time to master them—because they lack the Assault class' high rate-of-fire. They're high risk (low fire rate), high reward (lots o' damage), and demand a more carefully-paced rhythm of primary to secondary weapon switching to maximize damage. The Assault's high-speed rifle, however, steadily depletes armor, and its secondary heavy rockets can be detonated mid-air for splash damage. I got into a pleasant rhythm of pummeling opponents with my primary gun until it was nearly overheated, then finishing them off with a rocket. I would have liked more damage feedback, though. Unless I was paying very close attention to an enemy's little health bar, I didn't get much indication when a rocket hit its mark. Hawken never strays from the fiction that I'm in a real cockpit, and thus relentlessly bombards me with visual confusion caused by sparks, malfunctions, and the general awkwardness of piloting a walking tank. That consistency and fidelity makes it believable, which in turn makes the fights more meaningful and desperate. But it also means that, without explicit feedback where needed, it can be easy to lose track of what the hell is going on. Did I hit him? Not sure, because SPARKS AND FIRE! I can only imagine what it'd be like with an Oculus Rift . Hawken's other three mech classes—Berserker, Infiltrator, and Brawler—will have to wait for the next beta event. I'm still a rookie with the three I was dedicated to learning during this brief session. I also stuck to Deathmatch and Team Deathmatch while I became comfortable with combat. I love the idea of Siege mode, in which teams collect energy to launch giant ships at each other, then fight for control of an anti-air silo to take them down, but it was too much while I was still doing my best not to jet into walls. There's a lot to learn in Hawken—I didn't even get into the mech customization options and special equipment. It wasn't hard to get a few kills in my first round, but mastering one of Hawken's mechs seems like it'll take awfully deep investment. Say you're slightly damaged and you encounter a full-health Rocketeer. Do you try to evade his lock-on long enough to wear him down, lure him toward your teammates, or try to lose him and find a place to repair? Even if you have enough experience to make the decision, making your clunky metal crustacean cooperate requires a lot of skill. That may be good news, because it means that buying upgrades and items doesn't appear to be Hawken's primary motivator. Hawken rewards players who are good at Hawken.